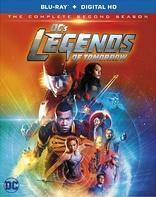 DC's Legends of Tomorrow amps up the firepower for Season Two of the Super Hero team-up series by enlisting both a league and a legion of new characters to join the legendary crew of the Waverider. Charged with protecting the timeline from temporal aberrations - changes to history that spawn potentially catastrophic consequences - the Legends reassemble with the addition of historian Nate Heywood (aka Citizen Steel) and Justice Society of America member Amaya Jiwe (aka Vixen). And yet, for every force of good, there is an opposing force of darkness. In Season Two, the Legends of Tomorrow face off against the first ever team of DC Super-Villains: the Legion of Doom, including Malcolm Merlyn, Damien Darhk, Captain Cold and the Reverse Flash. After saving the world from Vandal Savage and the corrupt Time Masters, the Legends of Tomorrow are now charged with protecting time (past, present and future) itself, taking them across history and up against the power of the Spear of Destiny...a threat unlike any humanity has ever known.